This Snare Drum was made by D.C. Hall, who started making drums in 1862, The Drum has the maker's name on it around the tone hole. 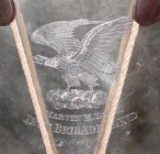 The Drum has the name of the musician who played it - Marvin H. Lynn - and also the Band he was in - Iron Brigade Band - engraved on it along with an Eagle. Mr. Lynn enlisted in the 7th Wisconsin in July of 1861, and then re-enlisted in the 25th Michigan in September of 1862, which became part of the Iron Brigade that year. Mr. Lynn served as a musician until mustered out in June of 1865. The heads are 16" in diameter and the Drum shell is 11 3/4" tall. The Drum shell is solid nickel silver, the same material that D.C. Hall used for his horns. The Drum Shell, Drum Rims, and top-head are original with the drum. 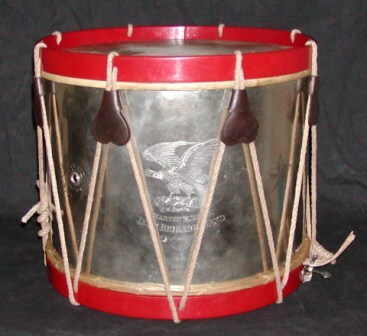 The Drum was professionally restored by Garman Bowers of Fairplay, MD.